Workshop a Success! See Photos, Program, more. After hiring a Director, a Musical Director, actors, musicians, securing rehearsal space, and a month of scoring music, I finally began the week long workshop of my musical. On day one, between the music and script, we handed everyone an almost 200 page binder. Musical Director Michael Fauss began rehearsing the music with the actors, then Director Scott Warren began reading the book with them. We edited things as we went through the week. After four days, it was time to give the actors a break and rehearse with the musicians. I worked through the night before the first band rehearsal until 4 AM creating woodwind and bass scores. It paid off, as the rehearsal went very smoothly on Saturday. 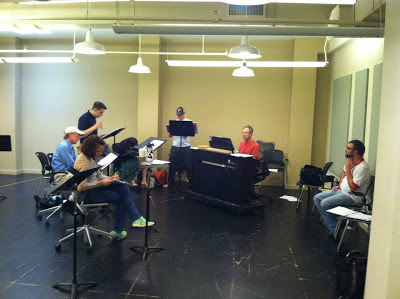 On Sunday, the musicians and actors got together and rehearsed the whole show. Sadly, we were so busy that weekend that I never managed to snap a single photo. It was amazing to see it all coming together. Then it was Monday, the day of the Showcase.